Last year I participated in this reading challenge and not only did I complete it, I read more than I had originally thought I would. 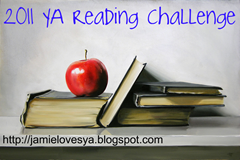 Since I love reading YA, I’m participating in this challenge again for 2011. Anyone can join. You don't need a blog to participate. Create a post about the challenge and click HERE to sign up. ►The Mini level – Read 12 YA novels. ►The Fun Size level – Read 20 YA novels. ►The Jumbo Size level – Read 40 YA novels. ►The Mega size level – Read 50+ YA novels. The Challenge starts on January 1, 2011 and goes until December 31, 2011. I’m going for the Fun Size level (read 20 YA books).